Gaspar's Chourico Slices 1 lb. Home / Pantry Items / Specialty Foods / Gluten Free / Gluten Free Meats /Refrigerated Foods / Chourico Products / Gaspar's Chourico Slices 1 lb. Home / Specialty Grocery / Specialty Foods / Gluten Free / Gluten Free Meats /Refrigerated Foods / Chourico Products / Gaspar's Chourico Slices 1 lb. Home / Pantry Items / Meats & Seafood / Portuguese Meats & Seafood / Chourico Products / Gaspar's Chourico Slices 1 lb. Home / New England Classics / Meats & Seafood / Portuguese Meats & Seafood / Chourico Products / Gaspar's Chourico Slices 1 lb. Home / Hot GIFT Ideas / Gifts For Him / Meats & Seafood / Portuguese Meats & Seafood / Chourico Products / Gaspar's Chourico Slices 1 lb. 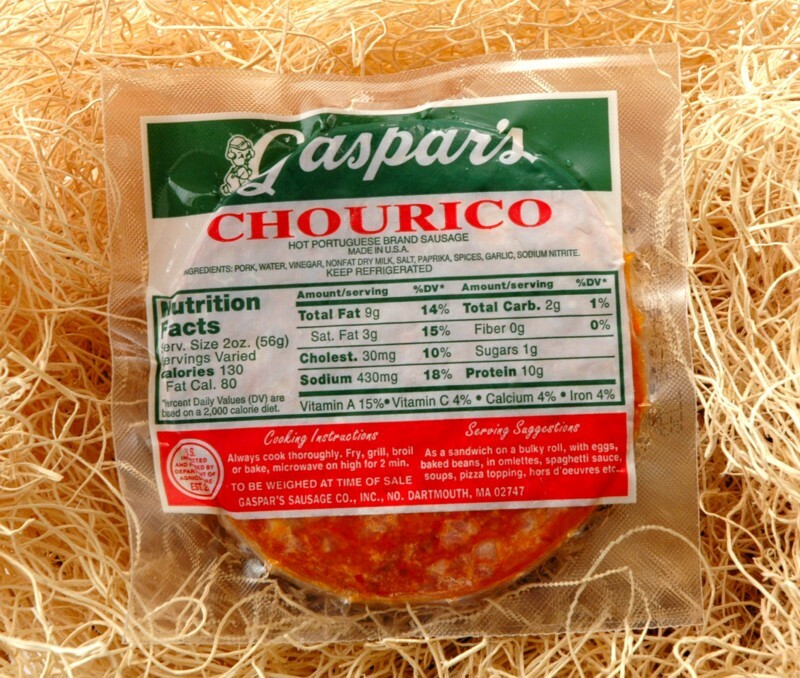 Home / Foods of New England / Meats & Seafood / Portuguese Meats & Seafood / Chourico Products / Gaspar's Chourico Slices 1 lb. Home / Meats & Seafood / Portuguese Meats & Seafood / Chourico Products / Gaspar's Chourico Slices 1 lb. Home / Specialty Grocery / Meats & Seafood / Portuguese Meats & Seafood / Chourico Products / Gaspar's Chourico Slices 1 lb. Home / Hot GIFT Ideas / Gifts For Him / Party Favorites / Meats & Seafood / Portuguese Meats & Seafood / Chourico Products / Gaspar's Chourico Slices 1 lb. Home / Local Portuguese Foods / Portuguese Meats & Seafood / Chourico Products / Gaspar's Chourico Slices 1 lb. Home / Pantry Items / Global Favorites / Local Portuguese Foods / Portuguese Meats & Seafood / Chourico Products / Gaspar's Chourico Slices 1 lb. Home / Specialty Grocery / Global Favorites / Local Portuguese Foods / Portuguese Meats & Seafood / Chourico Products / Gaspar's Chourico Slices 1 lb. Home / Pantry Items / Hometown Food Favorites / Global Favorites / Local Portuguese Foods / Portuguese Meats & Seafood / Chourico Products / Gaspar's Chourico Slices 1 lb. Home / New England Classics / Hometown Food Favorites / Global Favorites / Local Portuguese Foods / Portuguese Meats & Seafood / Chourico Products / Gaspar's Chourico Slices 1 lb. Home / Foods of New England / Hometown Food Favorites / Global Favorites / Local Portuguese Foods / Portuguese Meats & Seafood / Chourico Products / Gaspar's Chourico Slices 1 lb. Home / Specialty Grocery / Hometown Food Favorites / Global Favorites / Local Portuguese Foods / Portuguese Meats & Seafood / Chourico Products / Gaspar's Chourico Slices 1 lb. 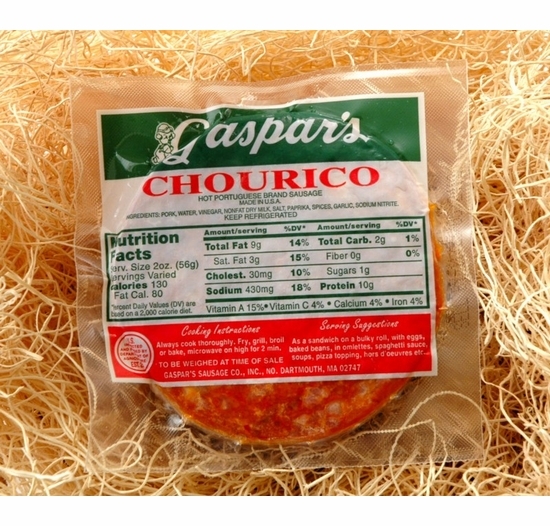 Home / Foods of New England / Local Portuguese Foods / Portuguese Meats & Seafood / Chourico Products / Gaspar's Chourico Slices 1 lb. 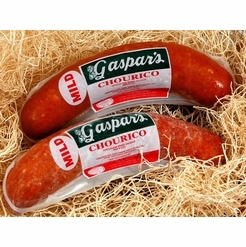 Home / Local Portuguese Foods / Portuguese Brands / Gaspar's Portuguese Meats / Chourico Products / Gaspar's Chourico Slices 1 lb. Home / Pantry Items / Global Favorites / Local Portuguese Foods / Portuguese Brands / Gaspar's Portuguese Meats / Chourico Products / Gaspar's Chourico Slices 1 lb. Home / Specialty Grocery / Global Favorites / Local Portuguese Foods / Portuguese Brands / Gaspar's Portuguese Meats / Chourico Products / Gaspar's Chourico Slices 1 lb. Home / Pantry Items / Hometown Food Favorites / Global Favorites / Local Portuguese Foods / Portuguese Brands / Gaspar's Portuguese Meats / Chourico Products / Gaspar's Chourico Slices 1 lb. Home / New England Classics / Hometown Food Favorites / Global Favorites / Local Portuguese Foods / Portuguese Brands / Gaspar's Portuguese Meats / Chourico Products / Gaspar's Chourico Slices 1 lb. Home / Foods of New England / Hometown Food Favorites / Global Favorites / Local Portuguese Foods / Portuguese Brands / Gaspar's Portuguese Meats / Chourico Products / Gaspar's Chourico Slices 1 lb. Home / Specialty Grocery / Hometown Food Favorites / Global Favorites / Local Portuguese Foods / Portuguese Brands / Gaspar's Portuguese Meats / Chourico Products / Gaspar's Chourico Slices 1 lb. Home / Foods of New England / Local Portuguese Foods / Portuguese Brands / Gaspar's Portuguese Meats / Chourico Products / Gaspar's Chourico Slices 1 lb. Home / BBQ & Grilling / Meats & Breads for Grilling / Gaspar's Portuguese Meats / Chourico Products / Gaspar's Chourico Slices 1 lb. Home / Hot GIFT Ideas / BBQ & Grilling / Meats & Breads for Grilling / Gaspar's Portuguese Meats / Chourico Products / Gaspar's Chourico Slices 1 lb. Home / Hot GIFT Ideas / Gifts For Him / Party Favorites / BBQ & Grilling / Meats & Breads for Grilling / Gaspar's Portuguese Meats / Chourico Products / Gaspar's Chourico Slices 1 lb. Home / New England Classics / Clambake & Seafood / Meats & Breads for Grilling / Gaspar's Portuguese Meats / Chourico Products / Gaspar's Chourico Slices 1 lb. Home / Foods of New England / Clambake & Seafood / Meats & Breads for Grilling / Gaspar's Portuguese Meats / Chourico Products / Gaspar's Chourico Slices 1 lb. Home / BBQ & Grilling / Clambake & Seafood / Meats & Breads for Grilling / Gaspar's Portuguese Meats / Chourico Products / Gaspar's Chourico Slices 1 lb. Home / Hot GIFT Ideas / BBQ & Grilling / Clambake & Seafood / Meats & Breads for Grilling / Gaspar's Portuguese Meats / Chourico Products / Gaspar's Chourico Slices 1 lb. Home / Hot GIFT Ideas / Gifts For Him / Party Favorites / BBQ & Grilling / Clambake & Seafood / Meats & Breads for Grilling / Gaspar's Portuguese Meats / Chourico Products / Gaspar's Chourico Slices 1 lb. Home / Pantry Items / Hometown Food Favorites / Meats & Breads for Grilling / Gaspar's Portuguese Meats / Chourico Products / Gaspar's Chourico Slices 1 lb. Home / New England Classics / Hometown Food Favorites / Meats & Breads for Grilling / Gaspar's Portuguese Meats / Chourico Products / Gaspar's Chourico Slices 1 lb. Home / Foods of New England / Hometown Food Favorites / Meats & Breads for Grilling / Gaspar's Portuguese Meats / Chourico Products / Gaspar's Chourico Slices 1 lb. Home / Specialty Grocery / Hometown Food Favorites / Meats & Breads for Grilling / Gaspar's Portuguese Meats / Chourico Products / Gaspar's Chourico Slices 1 lb. Home / Local Portuguese Foods / Hometown Food Favorites / Meats & Breads for Grilling / Gaspar's Portuguese Meats / Chourico Products / Gaspar's Chourico Slices 1 lb. Home / Pantry Items / Global Favorites / Local Portuguese Foods / Hometown Food Favorites / Meats & Breads for Grilling / Gaspar's Portuguese Meats / Chourico Products / Gaspar's Chourico Slices 1 lb. Home / Specialty Grocery / Global Favorites / Local Portuguese Foods / Hometown Food Favorites / Meats & Breads for Grilling / Gaspar's Portuguese Meats / Chourico Products / Gaspar's Chourico Slices 1 lb. Home / Foods of New England / Local Portuguese Foods / Hometown Food Favorites / Meats & Breads for Grilling / Gaspar's Portuguese Meats / Chourico Products / Gaspar's Chourico Slices 1 lb. Home / Pantry Items / Hometown Food Favorites / Gaspar's Portuguese Meats / Chourico Products / Gaspar's Chourico Slices 1 lb. Home / New England Classics / Hometown Food Favorites / Gaspar's Portuguese Meats / Chourico Products / Gaspar's Chourico Slices 1 lb. Home / Foods of New England / Hometown Food Favorites / Gaspar's Portuguese Meats / Chourico Products / Gaspar's Chourico Slices 1 lb. Home / Specialty Grocery / Hometown Food Favorites / Gaspar's Portuguese Meats / Chourico Products / Gaspar's Chourico Slices 1 lb. Home / Local Portuguese Foods / Hometown Food Favorites / Gaspar's Portuguese Meats / Chourico Products / Gaspar's Chourico Slices 1 lb. Home / Pantry Items / Global Favorites / Local Portuguese Foods / Hometown Food Favorites / Gaspar's Portuguese Meats / Chourico Products / Gaspar's Chourico Slices 1 lb. Home / Specialty Grocery / Global Favorites / Local Portuguese Foods / Hometown Food Favorites / Gaspar's Portuguese Meats / Chourico Products / Gaspar's Chourico Slices 1 lb. Home / Foods of New England / Local Portuguese Foods / Hometown Food Favorites / Gaspar's Portuguese Meats / Chourico Products / Gaspar's Chourico Slices 1 lb. 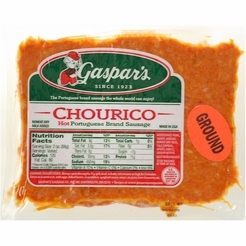 Home / Popular Brands / Gaspar's Portuguese Meats / Chourico Products / Gaspar's Chourico Slices 1 lb. Home / Hot GIFT Ideas / Holiday Entertaining / Gaspar's Portuguese Meats / Chourico Products / Gaspar's Chourico Slices 1 lb. Home / Foods of New England / Brands (New England Favorites) / Gaspar's Portuguese Meats / Chourico Products / Gaspar's Chourico Slices 1 lb. Home / Pantry Items / Meats & Seafood / Meat & Refrigerated Food Brands / Gaspar's Portuguese Meats / Chourico Products / Gaspar's Chourico Slices 1 lb. Home / New England Classics / Meats & Seafood / Meat & Refrigerated Food Brands / Gaspar's Portuguese Meats / Chourico Products / Gaspar's Chourico Slices 1 lb. Home / Hot GIFT Ideas / Gifts For Him / Meats & Seafood / Meat & Refrigerated Food Brands / Gaspar's Portuguese Meats / Chourico Products / Gaspar's Chourico Slices 1 lb. Home / Foods of New England / Meats & Seafood / Meat & Refrigerated Food Brands / Gaspar's Portuguese Meats / Chourico Products / Gaspar's Chourico Slices 1 lb. Home / Meats & Seafood / Meat & Refrigerated Food Brands / Gaspar's Portuguese Meats / Chourico Products / Gaspar's Chourico Slices 1 lb. Home / Specialty Grocery / Meats & Seafood / Meat & Refrigerated Food Brands / Gaspar's Portuguese Meats / Chourico Products / Gaspar's Chourico Slices 1 lb. Home / Hot GIFT Ideas / Gifts For Him / Party Favorites / Meats & Seafood / Meat & Refrigerated Food Brands / Gaspar's Portuguese Meats / Chourico Products / Gaspar's Chourico Slices 1 lb. Is made with the same recipe as linguica but has more of a "kick" to it. 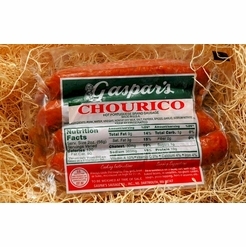 Chourico is a spicy sausage with different spices that is known to "kick it up a notch. Gaspar's Extra-HOT Chourico 1 lb. 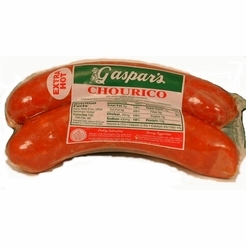 Gaspar's Chourico Franks 1 lb. 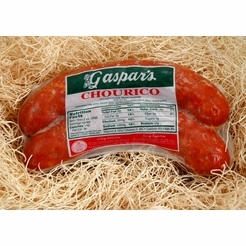 Gaspar's Ground Chourico 1 lb.